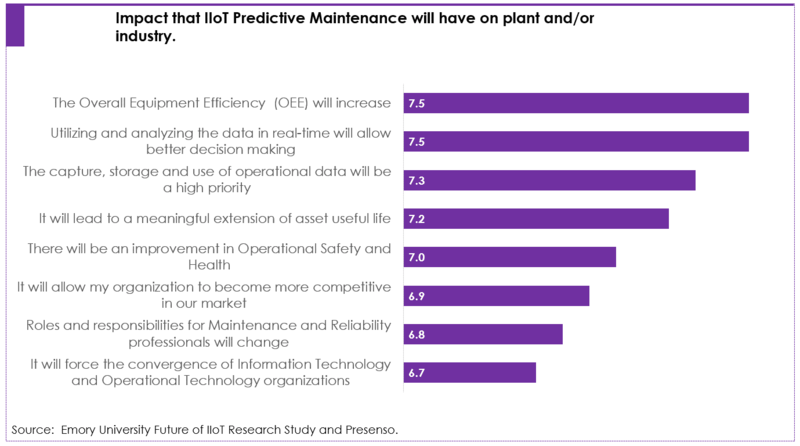 How do O&M professionals feel about the impact of IIoT and predictive maintenance? Most industry research into IIoT trends relies on insights gained from senior management and decision makers. 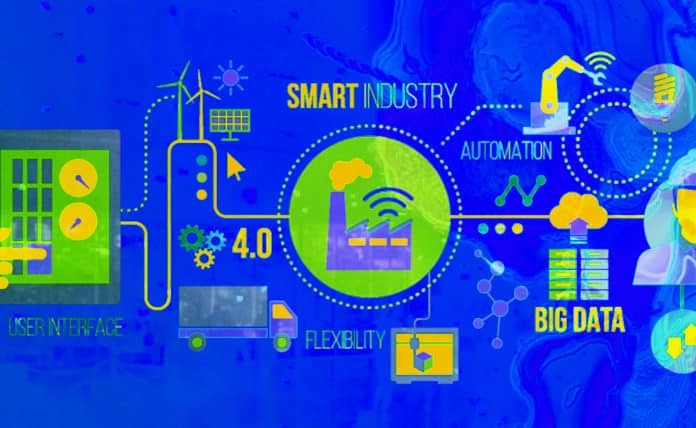 A new study by Emory University students and Presenso is designed to gain an understanding of the outlook for IIoT from the perspective of plant-level Operations and Maintenance (O&M) employees. There is little discontent with current Predictive Maintenance systems. Traditional Predictive Maintenance including vibration monitoring, oil residue analysis, and thermal imaging still dominate and manual statistical modeling such as Excel has not been replaced by more advanced technologies. O&M professionals expect that Automated Failure Reporting and Automated Repair Scheduling are most likely to be widely adopted over the next five years. There are limited expectations for the deployment of Robotics Assisted Repair and Drone/Robotics Assisted Inspection. 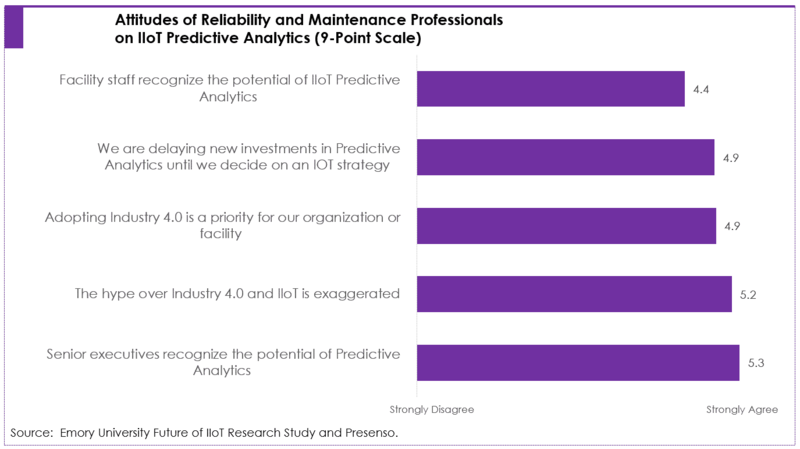 O&M professionals are less enthusiastic about IIoT for Predictive Maintenance than senior management. Part of this is attributed to the “hype” that resonates less with the Maintenance and Reliability workers who are responsible for implementation. 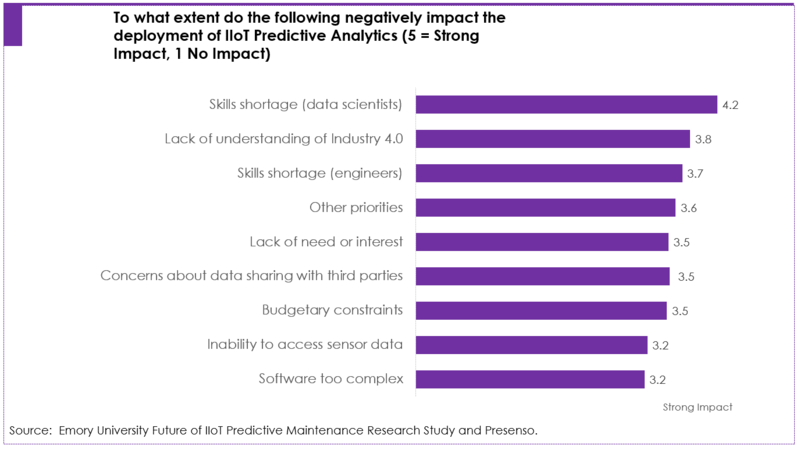 The most significant inhibitor of IIoT for Predictive Maintenance deployment is a skill shortage of Big Data Scientists and a lack of understanding of Machine Learning. 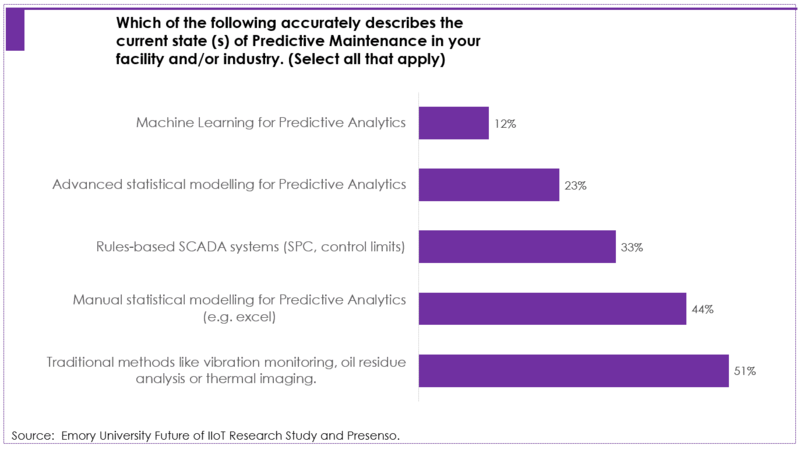 Overall, O&M professionals have a positive view of IoT Predictive Maintenance. Improvements to Operational Equipment Efficiency (OEE) are widely expected. Furthermore, most survey respondents believe that utilizing and analyzing the data in real-time will allow better decision making. In general, O&M professionals have adopted a wait-and-see approach and are not getting swept up in the enthusiasm about Industry 4.0. They see the potential value but are concerned about deployment challenges. To read the full study, please visit this page. Written by Arnav Jalan, Emory University.